I have my Twitter bookhearts to thank for bringing this novella to my attention. I immediately downloaded for comedy purposes. But to my surprise, the synopsis actually sounded okay. Lady Madeline Parker is perfectly happy with being a spinster all her life. She has no dreams to marry well. So of course she runs away from a loveless arranged marriage. Looking for anything but love, she runs into the arms of a handsome sailer named Harland. 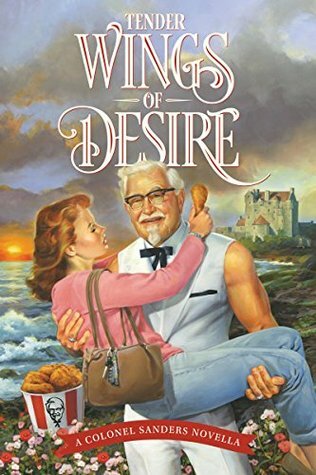 I didn't have high hopes for a Colonel Sanders novella. But I was most disappointed not by the storyline or characters, but for the lack of fried chicken references! For goodness sakes—the title is Tender Wings of Desire. 🗣 THERE IS A BUCKET OF FRIED CHICKEN ON. THE. COVER! But nann mention of a chicken wing, thigh or breast in the whole book. I was really looking forward to reading some chicken love.